Reem just got some new clothes. Like any 10-year-old with a new outfit, she can't wait to show them off. "The first thing that I will do with my new clothes is to wear them to school," says Reem. But unlike for other kids her age who live in houses with heat and electricity, Reem's new clothes are just about the only thing standing between her and the cold. Since fleeing war back home in Syria six years ago, Reem and her family have been living in a tent in Jordan, and her new clothes are part of a shipment UNICEF and its partner Mateen just delivered to 3,800 displaced Syrian children to protect them during the harsh winter months. Freezing temperatures and primitive living conditions are putting children's lives at risk in tented settlements across the Middle East and North Africa. In the past month, at least eight children — most of them under 4 months; the youngest, just one hour old — have died in southeast Syria at the Rukban camp near the Jordanian border, where nearly 50,000 people live, the majority of whom are women and children. Over the past month, in the northeast, 29 children and infants have died of exposure on their families' flight from conflict or upon arrival at a camp in the Hasakah region. Mostly women and children, the displaced arrive at the camp with no belongings, some even barefoot. Because there aren't enough tents to go around, families are forced to sleep outside, many with no blankets. 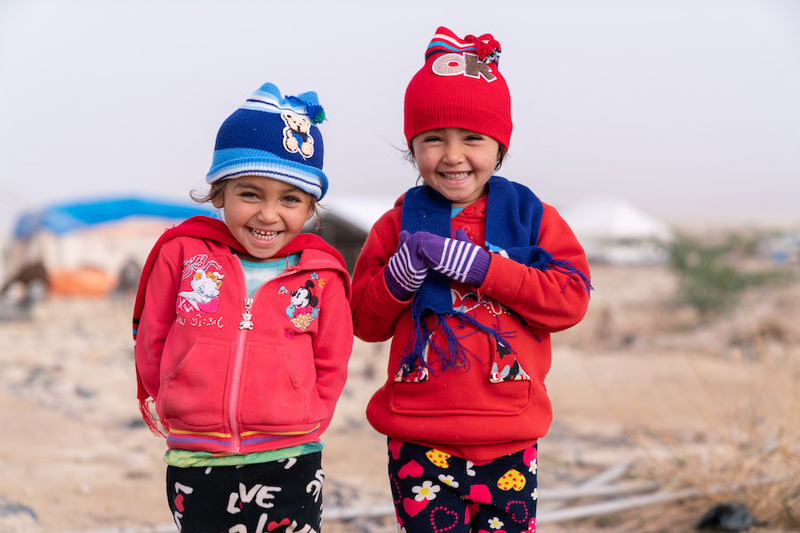 For children who have so little, UNICEF's delivery of warm winter clothes offers essential protection from the elements and something else that's vitally important — hope. 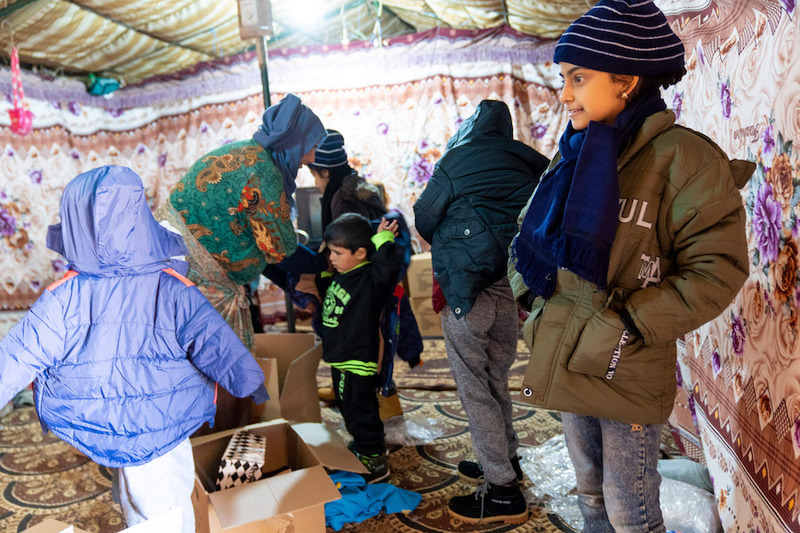 "When I saw the winter clothes I was very happy because for a very long time we didn't have any," said Reem's 11-year-old sister, Muna (far right, above), the day the winter gear arrived. "It gets cold at night and it's really tough. I love the jacket the most because it is so warm. I can wear it in the evening when it gets cold." Muna and Reem's mother, Fatima, calculated the price of the clothes her eight children (above) received at $282 — far more than she and her husband, Ahmad, could ever afford. Since moving to Jordan, the family has had to make do on the wages Muna and Reem's father, Ahmad, earns as a seasonal agricultural worker. Fatima says that income could never have covered the cost of the clothes her eight children (above) received — especially in winter when they need them most. Fatima and Ahmad aren't the only parents facing impossible choices. Without proper footwear, children can get sick and suffer frostbite. After this month’s storms in Lebanon, Syrian refugee children were seen wading through the freezing water that flooded the tents where they live in flip flops. 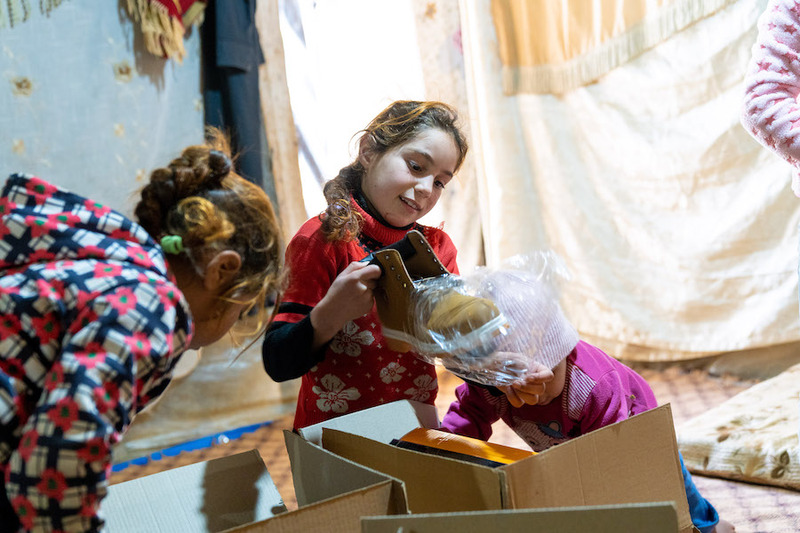 “Sandals are okay for the summer, but they are cheap and not good for winter,” says Malak, whose two daughters Sita, 4, and Tawaseef, 5, (above) were born in Jordan's informal tented settlements. 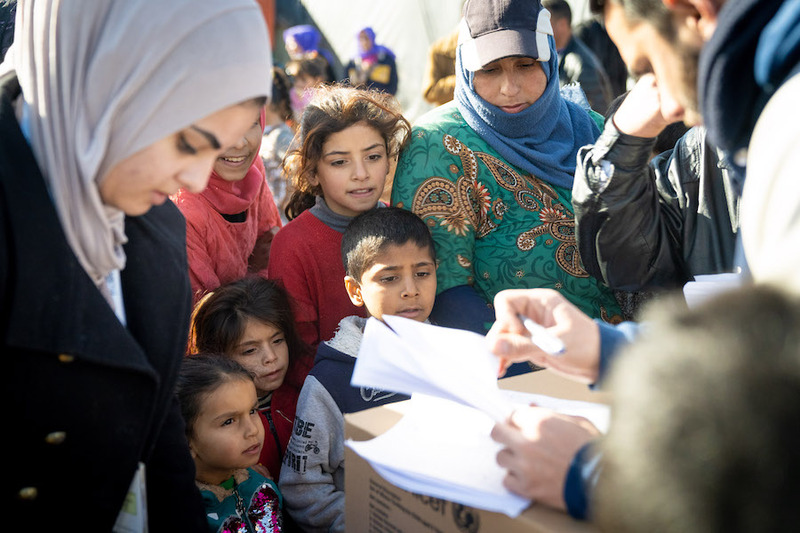 When the family recently received their stock of winter clothes — their first in the six years since they left Syria — everyone was overjoyed. “The scarf is soft and I love it!” says Sita. Malek likes the boots, too, but for other reasons. These — the first pair of warm winter boots her children have ever owned — mean that now her daughters can do what all children love: run around outside and have fun. You can help protect Syria's children from the cold this winter. UNICEF and partners are working tirelessly in Jordan, Syria, Yemen, South Sudan, Bangladesh and around the world to save and protect children. With a presence in more than 190 countries and territories, UNICEF has helped save more children's lives than any other humanitarian organization in the world.